“Mr. Burns, A Post-Electric Play” by Anne Washburn is a critically acclaimed favorite for the millennial generation. Washburn envisions life for survivors following an apocalypse that has decimated the population and destroyed their infrastructure, including the nuclear power plants. The resulting radioactivity further decimates the population several times over. Survivors group together defending themselves from marauders and wondering how to build a new world as they grieve for all they have lost. Family, friends, lovers, neighbors, refrigeration, television and texting are all obliterated. A group of survivors gather around a campfire with weapons handy should any intruders be dangerous. They have salvaged a beer or two and struggle with their loss by reconstructing a favorite episode from ‘The Simpsons’ television show. Mr. Burns, the CEO of the Springfield Nuclear Plant is sending threatening letters to Bart Simpson. It is important to bring this normalcy into their lives, and they focus on the Simpson family as they also begin to reconstruct a culture, building an oral history for future generations. “Mr. Burns, A Post-Electric Play” is a co-production of Oklahoma City Repertory Theatre (CityRep) and Oklahoma City University. 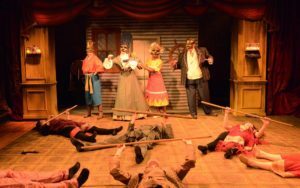 CityRep provides a high standard of excellence in professional theatre in this region, and the nation. This collaboration combines the epitome of professionalism and the enthusiasm of scholarship to create a masterful production. Brian Parsons, Associate Dean of the Oklahoma City University School of Theatre directs a superb cast and oversees an incredible crew for an intricate production. Parsons guides the large cast through a multiplicity of stereotypical roles. He asks in the Director’s Note from the program: ‘The play asks you this simple question…after a catastrophic event such as total failure of the electrical grid and the subsequent societal breakdown and slow rebuilding – how high on the list of things of necessities would you place the theatre?’ The question the play asks is answered by this production. Theatre is story-telling, story-telling evolves into theatre, and the Simpson episode becomes the basis of culture in their new world. Voltaire said that ‘If God did not exist, man would invent Him” and he is frighteningly right. The characters represent a reality of society we struggle with even though we have electricity and refrigeration and television. Today our culture has become polarized, fragmented, and disposable–our facades are all that we dare reveal. Under our superficial, somewhat shallow exteriors substance and emotional connections are hidden or obscured, if not numbed and undeveloped. Washburn has created characters that reflect this aspect of society. The challenge for the actors is to play these roles effectively without the convenience of standard character development. The seven lead players out of the sixteen outstanding performers, Timothy Fall, Sarah Feist, Kris Schinske, Paul Taylor, Ashley Arnold, Bob Hess and Liza Clark are all superb performers. In their individual ways they present uniquely exciting interpretations of characters and caricatures that are emotionally stunted from shock. The entire cast is superb, sublime and stimulating. While Washburn targets millennials in “Mr. Burns, A Post-Electric Play” she does not neglect other generations of theatre goers. Some seasoned goers may react with fear, dislike, and shame, but they can’t stop talking about it. Washburn’s intention succeeds due to the mastery, dedication and drive coming out of Oklahoma City University School of Theatre and Oklahoma City Repertory Theatre. Cast members include professors, students, and professionals with a connection to the University and CityRep. The production is a technical masterpiece under the expertise of Production Stage Manager, Steve Emerson. Jason Foreman’s set designs are interesting and striking. Andy Wallach’s costumes are appropriate, expressive and some are quite lovely. Lights, properties and sound effects are integral and complement Parson’s direction. It should be noted that gunshots are fired. Robert Pittenridge, crafting gorgeous masks in the tradition of Greek tragedy enhances enlivening the final act. Properties are extensive and well placed. Eric David Frei is Musical Director and Sheri Hayden is responsible for natural as well as stylistic movement and choreography. The actors have the opportunity for excellence in the CitySpace Theatre located in the lower level of the Civic Center Music Hall. “Mr. Burns, A Post-Electric Play” is being performed at the Civic Center Music Hall in downtown Oklahoma City through March 5, 2017. Curtain is at 7:30 for evening performances on Friday and Saturday and 1:30 for matinee performances on Saturday and Sunday. For information and tickets visit www.cityrep.com or call 405-848-3761 for the CityRep box office. The Civic Center Music Hall box office number is 405-682-7579. “Mr. Burns, A Post-Electric Play” is a must see for millennials to enjoy and important for all to absorb. As there is insufficient space in the newspaper and virtually unlimited space online remarks regarding the performances in “Mr. Burns, A Post-Electric Play” can and should be expanded. Kris Schinske exhibits in her performance a stronger emotional presence and connectivity in every character she portrays. Her performance brings the audience into the play, allowing a more empathic response. Her consistency and reliability may not be the most romantic of accolades, but, combined with her talent she is a favorite performer for many patrons. Liza Clark is a senior musical theater major at OCU in the voice studio of Larry Wade Keller. Her talent is abundantly clear in this performance. One of the characters she developed did not seem to have an exceptional voice; good, just not excellent. This is important to an audience, creating a natural effect. Clark’s ability to take it down a notch indicates vocal range and versatility that is outstanding and in “Mr. Burns, A Post-Electric Play” very much appreciated. Timothy Fall delivers with tremendous versatility and his understanding as Matt in the first act is familiar to everyone who has ever stayed up all night with someone who hankers for attention and actually deserves it for a change. Fall creates great interest in all the characters in “Mr. Burns, A Post-Electric Play” and additional develops a sincere rapport with other cast members. Sarah Feist creates an aura of normalcy adding an interesting spice to a character facing a situation outside any bounds of normalcy. This attitude adds a degree of simplicity to an otherwise complicated script and allows her to display her theatrical sense to advantage. Paul Taylor has an ability to jump from a calm voice of reason in one character to another persona ruled by an insane compulsion for revenge. He becomes menacing without oddity and makes a cartoon a nightmare. Taylor’s broad range is extraordinary and a wonderful aspect of Parson’s excellent casting. Bob Hess is also versatile and clearly brave. His ability to take on any role demanded without hesitation while reaching for the extreme is incredibly entertaining. His face is expressive, packing emotion into his portraiture that can be fascinating or funny. Ashley Arnold has a beauty and style that comes through in each character commanding attention and, as needed, respect or sympathy. Arnold is an OCU student pursuing a degree from the School of Music. She can look forward to a vivid career in music and musical theatre as her talents are well-rounded and in demand. Nine actors in this show have smaller roles that are extremely important to the show. Seven of them also understudy the lead performers mentioned above. Their work cannot be over looked. The third act of “Mr. Burns, A Post-Electric Play” gives us a future based on flawed memories and conceptions, yet is singularly accurate in the intent. Caroline Stella, Maddie Razook, Bailey Burleson, Tobi Kay Harrison and Mercedes Arndt are all exceptionally poised with beautiful intensity and integrity. The dedication to craft these five beautiful young ladies exhibit indicates a degree of competency as well as exceptional talent that is found in students from Oklahoma City University. Bringing a strong sense of style to the production, they also treat patrons with a distinct flair in their individual parts. Jordan Jacobs, Kevin Taylor, Nick Plasko and Blake Sauceda are all gentlemen from Oklahoma City University as well. There is an aura of sophistication and intellectual security that, when emanating from students, is very impressive. Combining this aura with talent as we see in “Mr. Burns, A Post-Electric Play” creates a sure winner in performance. 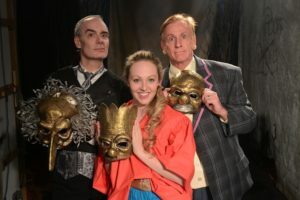 All together these young people create a standard of theatre combining classical Greek with modern humor that makes the statement Washburn wishes the third act to explore extraordinarily and tragically amusing. Congratulations to the entire cast. A more perfect basket of apples could not be found anywhere.